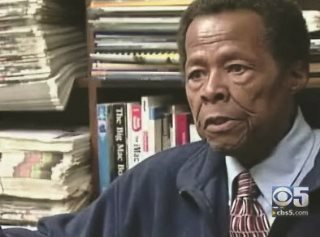 AFRICANGLOBE – I am an 84-year-old angry Black man. I am Mississippi born, Mississippi bred and Mississippi fled. I am the son of former slaves. My parents and I rode in the back of the bus. We rode in the front of the trains. We drank from water fountains designated for coloreds only. We picked cotton in fields owned by White people. My parents attended separate but equal schools in Mississippi. I attended separate but equal schools in Mississippi and in Oakland, California. My wife was educated in Oakland public schools and at the University of California at Berkeley. She could not get a job teaching in Oakland Public schools in Oakland in 1954. I hold an undergraduate and a graduate degree from the University of California at Berkeley. I was profiled at a Washington, D.C., hotel in 2010, forced to sleep in a homeless shelter overnight. I saw nothing in the Zimmerman case that surprised me. The system worked as it was intended. Zimmerman, a White man, was tried by a White justice system for killing a Black boy. The outcome was predictable. Many White people saw this as a non-racial event. The O.J. Simpson jury found for the defense. The jury found reasonable doubt. The George Zimmerman jury found for the defense. The six White women on the jury found reasonable doubt. Zimmerman admitted that he killed Trayvon Martin. Simpson denied that he killed anyone. The press excoriated the Simpson jury. The Zimmerman jury was praised. In both cases, the state presented weak cases. There are lessons to be learned from both cases. Laws are made to control the actions of people who can’t afford to break them. Both Simpson and Zimmerman bought as much justice as they needed. Their jurors were presented with reasonable doubt. In the Zimmerman case, there are some facts that concerned citizens should understand. George Zimmerman is White. The juror of unknown ethnicity is White. The police who refused to arrest Zimmerman and who testified for him were White. The judge, and the prosecution were White. Every critical function carried on in that justice system was performed by a White person. Such is the case in almost every trial or plea bargaining case involving a Black man in this country. George has been described as Hispanic. That does not mean that he is not White. The term Hispanic is a political designation that describes national origin, not race. Hispanic is a protected designation under our civil rights laws, but the term is not racial. I would guess that George Zimmerman, on his driver’s license under race, is designated White. The most important fact to know is that the prosecution worked as hard for George Zimmerman as they did for the state of Florida. The prosecution did not challenge the lack of Afro Americans on the jury. The prosecution did not present its own theory of the case; it reacted to Zimmerman’s story of the case. The prosecution’s case should have been presented on the theory that the wounds displayed by Zimmerman were self-inflicted. Zimmerman inflicted those wounds on himself. Zimmerman knew enough about the law to know he needed such wounds. Such a prosecution theory would have forced the defense to defend against this theory, and it might have caused Zimmerman to testify. Instead, the prosecution introduced a tape made by the Zimmerman defense. The prosecution should have fought to keep that tape out of the trial. In a just world this prosecutor would be disbarred for malpractice. The second worst flaw in the prosecution’s case was their failure to challenge Zimmerman’s voice recognition by his friends and relatives. The prosecution needed to recode several voices saying what Zimmerman was alleged to have yelled on the 911 tapes, replay them and ask each of the witnesses to identify the Zimmerman voice. The third flaw by the prosecution was to bring in a skinny dummy. They should have brought in a live person of the same height and weight as Zimmerman and required that person to pull his gun with Trayvon on top of him. The prosecution should have punctured a heart with Trayvon on top to test blood spatter. If Zimmerman had a broken nose, who repaired it? Finally, if Trayvon was on top of Zimmerman when he was shot in the heart, why was there no blood of Trayvon Martin’s on Zimmerman’s clothes? Why was this question not asked at trial? The justice system worked as it is designed to do. The system exonerated a White man who admitted killing a Black boy. The Justice Department will not bring an action in this case. Just because the man who heads it is Black does not mean he runs it. DOJ is a system that runs the same no matter who is at the top. Racism is structured into most of the important systems in this country. Communications – 99% of the TV, radio and print media properties are owned by White people. Construction – 99% of the construction in this country is done by White people. Education – 99% of all educational resources are allocated by White people. Transportation – 99% of all transportation is controlled by White people. Justice – this system is 99.9% controlled by White people. Financial – this system is 99.9 % controlled by White people. When Congresswomen Maxine Waters asked that 0.000001 percent of the $700 billion bailout money go to banks owned or controlled by descendants of former slaves, they tried to put her in jail. If we think that we get fair treatment in any of these systems, we must re-examine our definition of fairness. As an old and angry Black man I have seen the diminution of racism in my lifetime. We are not there yet. It is unlikely that we will get there in the lifetime of my grandchildren. Joseph Debro is president of Bay Area Black Builders and of Transbay Builders, a general engineering contractor, former director of the California state Office of Small Business, co-founder of the National Association of Minority Contractors and a bio-chemical engineer. He can be reached at: [email protected].